The Ho-Chunk Museum opened its doors to the public for the very first time on Saturday, March 9, to host a cultural class. The building is located on 1108 Superior Avenue downtown Tomah, Wisconsin. 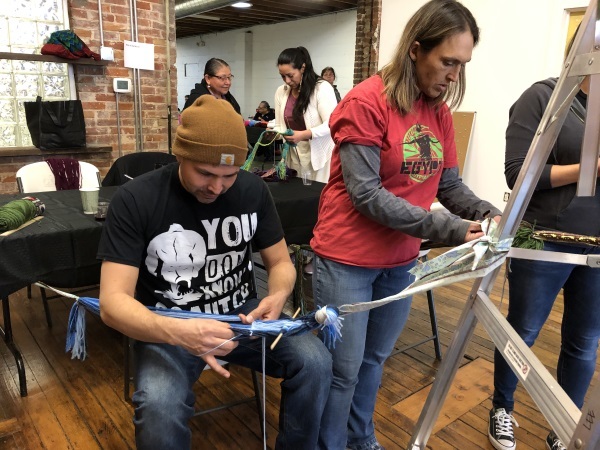 Community members stopped in throughout the day for a sneak preview of the space and participated in a yarn belt weaving class. Museum Director Josephine G. Lee has been working on introducing the Ho-Chunk Museum and looks forward to continuing to expand the project. “I wanted to host some classes because that’s really what heritage and preservation has been working towards is creating open learning environments, and we have the space,” Lee said. Bonnie Bird was asked to help teach the yarn belt weaving class. “I’m always more than happy to share what I know. I love teaching others because I know that weaving is kind of a lost art, and not very many people know how to do it,” Bird said. According to Josie Lee, sharing knowledge and helping Ho-Chunk people learn how to weave a yarn belt goes beyond preserving the craft. “It is really helping to have people to connect with their identity. And some ways that people do that is learning something new and something tangible - they can say that makes them Ho-Chunk and they can pass that on,” Lee said.